As Cape Town struggles to keep the taps flowing amid the worst drought in a century, agriculture is taking a hit. Water restrictions have especially impacted the fruit and vegetable industries, with 80 percent fewer potatoes being planted this season, for example. The unfolding water crisis in South Africa may play out with increasing frequency around the world, as population growth, water pollution and climate change stress dwindling water resources. Procuring ingredients from water-stressed regions is becoming riskier. That’s why a growing number of companies are seeking to minimize their risks by setting goals to source key commodities sustainably—or, in ways that reduce the environmental and social impacts of growing those crops. 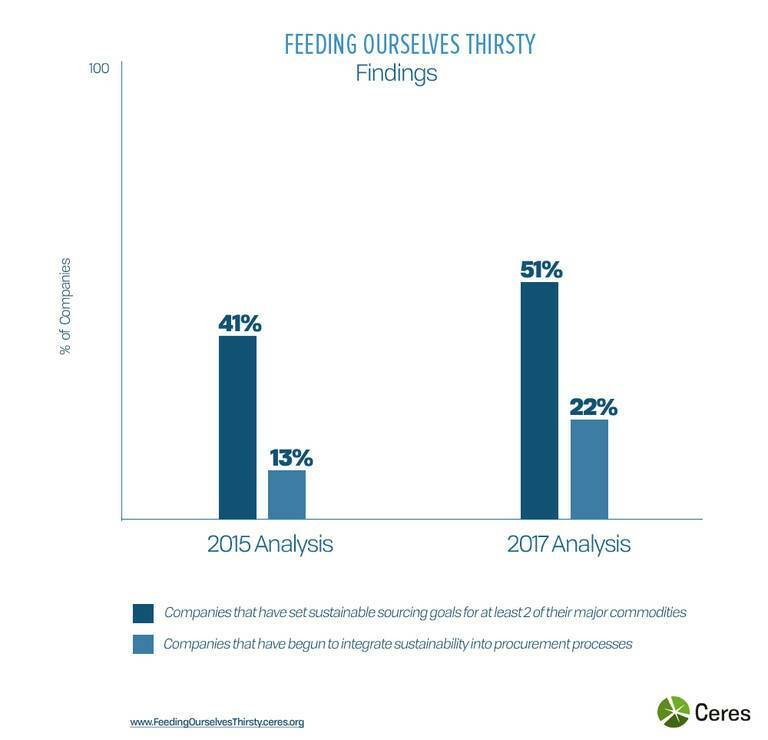 In fact, more than half of the 42 companies ranked in Ceres’ analysis of how the food sector is responding to water risk have set sustainable sourcing goals for some of their major commodities. The problem is, too often, these sustainable sourcing commitments aren’t backed by robust directives or incentives for internal procurement teams. And without the support of procurement –the corporate function that optimizes supply security and quality, while minimizing costs and price volatility–companies are unlikely to solve the massive agricultural sustainability risks they’ve identified. Some 70 percent of the companies we ranked haven’t taken steps to integrate sustainability commitments into their procurement processes. This means that their procurement teams and suppliers aren’t up to date on the company’s sustainability commitments. Buyers aren’t equipped with the understanding they need to decide which suppliers they should source from and what kinds of obligations they should include in contracts. And companies aren’t tracking whether suppliers are following through on commitments the company has set. While a growing number of companies recognize this disconnect between sustainable sourcing goals and procurement as a key obstacle to achieving their sustainability commitments, few are digging in to address it. Campbell Soup, Mars, ABInBev and Group Danone are among those who are. One of Campbell’s key steps is placing people with sustainability expertise into the procurement department. Two formal positions now integrate sustainability and procurement, including the Director of Responsible Sourcing, who has CSR and sustainability expertise, sits on the leadership team and reports to the Chief Procurement Officer. According to Dave Stangis, Vice President for Corporate Responsibility and Chief Sustainability Officer for Campbell Soup, embedding these roles within the procurement team makes training buyers on sustainability commitments, and the supplier expectations that flow from them, more organic. “The company benefits when the department that delivers on those commitments is also the one that makes them,” says Stangis. At the same time, Campbell has also built a roadmap for responsibly sourcing its priority ingredients, and trains buyers on using this roadmap with updated supplier expectations. Like Campbell, Mars has embedded sustainability roles into the procurement department at the highest level. Its long-time Chief Sustainability Officer, Barry Parkin, has assumed the lead role in procurement, according to Mars spokesperson, Lisa Manley. The company has also set impressive science-based goals for reducing its impact on land, water and farmer communities, and is working to integrate these into the procurement process, with an emphasis on its top 10 ingredients. Mars trains its buyers on sustainability commitments, embedding details about sustainable sourcing into supplier contracts, and it works closely with its suppliers, sharing its commitments and developing farmer partnerships. It offers agronomist support and farmer training, and pays a small premium to rice farmers who adhere to its sustainable sourcing guidelines. The brewing giant ABInBev factors sustainability into procurement directives, providing guidance to suppliers on agricultural ingredients through its sustainable agriculture guiding principles. These principles are being integrated into AB InBev’s internal governance routines and procurement processes. Group Danone follows a similar approach. Clearly, there is no one-size fits all approach to integrating sustainability into procurement practices. Each company needs to find a system that works best for it. Regardless of the approach, the first order of priority is to set time-bound measurable goals for sustainable sourcing, and to simultaneously get senior executive buy-in and understanding of the business case for sustainable sourcing. Other important steps include: ensuring that your supplier codes and polices are both strong and linked to sustainable sourcing goals; and implementing structures for training and incentivizing both buyers and suppliers. Making sustainability a standard part of how food companies purchase the ingredients they rely on is an evolving practice. But as our agricultural systems face the new reality of water scarcity and climate change, food companies must hasten to forge the missing link. Eliza Roberts is Senior Manager of Water at Ceres, a sustainability nonprofit organization working with the most influential investors and companies to build leadership and drive solutions throughout the economy.